The Cliffside is an area in Treacherous Mansion in Luigi's Mansion: Dark Moon. As mentioned by the name, the area comprises the various ledges on the side of the rocky stack the Treacherous Mansion is built on, and is accessible via the Guard Tunnel, the Ceremonial Chamber and the Haunted Catacombs. There are two main levels to this area. The first one connects the Guard Tunnel and Ceremonial Chamber together, and has a grate and wheel mechanism. Spinning this wheel lifts the grate and lets Luigi enter the door to the Ceremonial Chamber. 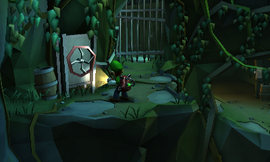 The second area is lower down the side of the cliff, and is accessed from the Haunted Catacombs. This part has various plants that can be interacted with or pulled down to get money and a gem, as well as a path that leads round to cliff to an area where some gold bats and a treasure chest with money can be found. In Front-Door Key, the top part of the Cliffside is visited in Luigi's hunt for the Polterpup who took the key, since a wall blocks the direct path between the Guard Tunnel and Ceremonial Chamber. The second area might also be visited at this point. In the other missions aside from Terrifying Invasion, the Cliffside is inaccessible like most other basement areas of the mansion. This page was last edited on September 24, 2017, at 03:34.